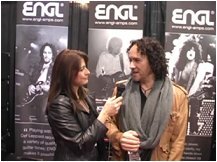 Def Leppard guitarist Vivian Campbell was interviewed by DJ Frankie DiVita of 96.7 KCAL Rocks at the recent NAMM show. Vivian talks about the 2011 Mirrorball tour and album. The upcoming 2012 tour, playing with Thin Lizzy and his solo work/live shows. "We're gonna go out again this summer. We don't know the exact details yet but we'll be out in America this summer."